I was surprised to discover that this word existed before I was born. It certainly wasn’t part of everyday speech in my youth, but I think it describes what I want to talk about. 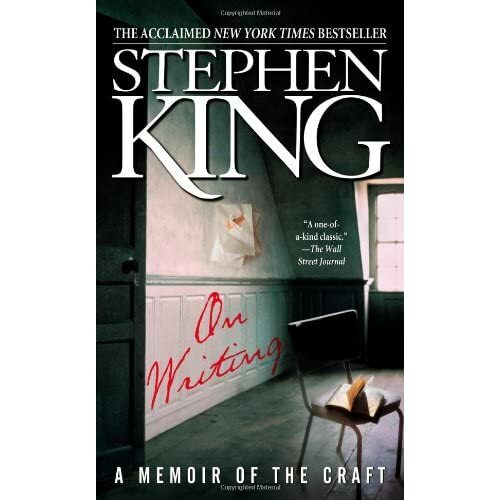 I’m reading Stephen King’s book: On Writing. I’ve found it’s a good book to read in small chunks, whenever a moment appears. King himself advises reading in waiting rooms, theatre lobbies, while working out on a treadmill and elsewhere. I keep his book next to my computer and pick it up when I’m waiting for the computer to finish some action or waiting for my brain to catch up. If I can’t decide how to continue what I’m doing or what to do next, I read a bit and somehow the decision becomes easier. On the subject of writing, King says, “Don’t wait for the muse.” He says we should get into the same writing routine every day with no distractions and the door closed, and sooner or later the muse will show up. Proactiveness. And so it is in life. I’m reminded of a joke. You must have heard some version of it. I found one here. It was flooding in California*. As the flood waters were rising, a man was on the stoop of his house and another man in a row boat came by. The man in the row boat told the man on the stoop to get in and he’d save him. The man on the stoop said, no, he had faith in God and would wait for God to save him. The flood waters kept rising and the man had to go to the second floor of his house. A man in a motor boat came by and told the man in the house to get in because he had come to rescue him. The man in the house said no thank you. He had perfect faith in God and would wait for God to save him. The flood waters kept rising. Pretty soon they were up to the man’s roof and he got out on the roof. A helicopter then came by, lowered a rope and the pilot shouted down to the man in the house to climb up the rope because the helicopter had come to rescue him. The man in the house wouldn’t get in. He told the pilot that he had faith in God and would wait for God to rescue him. The flood waters kept rising and the man in the house drowned. When he got to heaven, he asked God where he went wrong. He told God that he had perfect faith in God, but God had let him drown. * or London, or Jerusalem… well, maybe not. So, don’t wait for it to happen. You have to make it happen. Proactiveness. Yes, I’ve heard the joke and the bit about not waiting for the muse–but it seems we can’t be reminded enough. Thanks for the comments. You’re all right (in both senses). Why wait for the muse? Threaten him/her to show up!